Je suis oiseau, voyez mes ailes. Je suis souris, vivent les rats. English: I’m a bird, look at my wings. I’m a mouse, long live the rats. 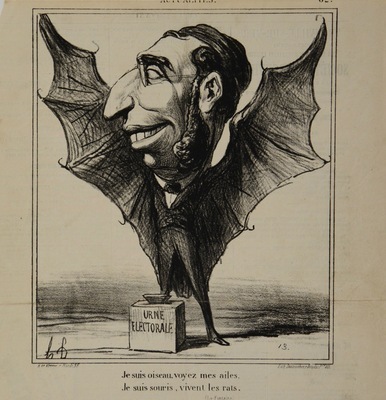 Published near the end of Emperor Louis Napoleon’s rule, when censorship laws were liberalized, Daumier drew this unflattering caricature of politician Emile Ollivier—a liberal monarchist against whom Le Charivari launched a barrage of editorial attacks during the general elections of 1869. The print’s caption was taken directly from a well-known fable (“The bat and the two weasels”) by 17th century French poet Jean de la Fontaine. As in the work by John Doyle (to the left), the politician is represented as a half-human and half animal hybrid.